Back in September, E sent me this great review of Elementals from her end-of-summer vacation to Whistler. I'm finally posting it - better late than never, right? Enjoy! M and I took to the road last weekend and headed up to Canada for a last hurrah before the new school year. 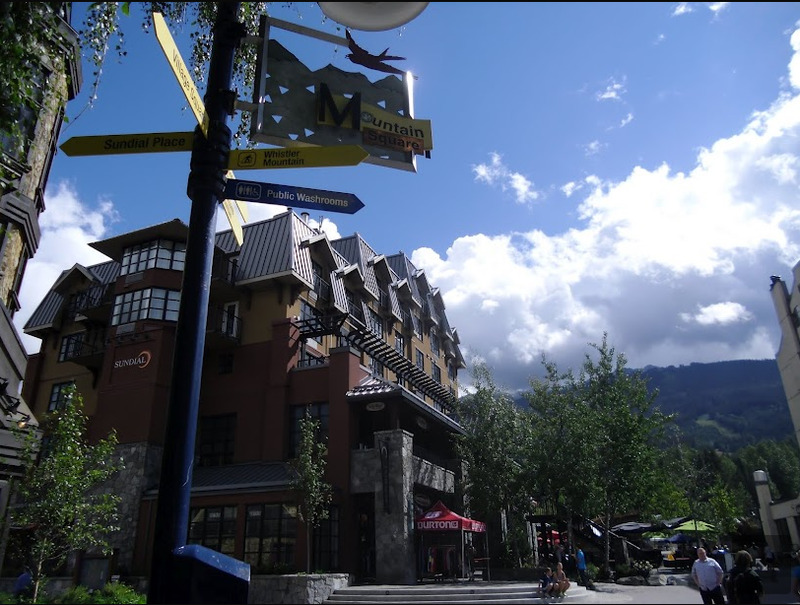 Our vacation destination was Whistler, the beautiful ski resort and mountain village in British Columbia featured in the 2010 winter olympics. Our hotel was at the foot of Blackcomb Mountain (Whistler's matching peak) and we spent a lot of time hiking by pristine lakes and streams. We made time for a romantic date night, though, and went to "Elementals Urban Tapas". We've come to like the multiple small plate style of dining because it allows us to try a wider variety of dishes; the restaurants adhering to this model also seem to be typically trendy and lounge-like which we like for ambiance. This restaurant was no exception, and the dim lighting and open kitchen set the mood and gave us a lot to watch. We kept one of our menus so we could try to guess what the chefs were cooking. The chefs were also very talented; the food was delicious and we enjoyed our meal enormously. 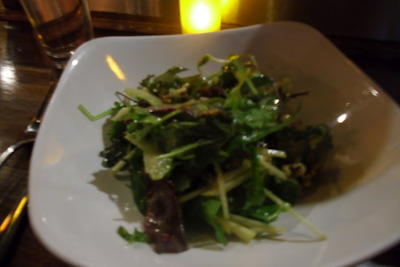 We started with a simple green salad, with apples, celery, toasted nuts, and arugula, dressed with a light and complementary vinaigrette. It was crunchy and good and helped us pace ourselves so we could prolong the evening with additional courses. For our next course we chose the lettuce cups, which came on a long tray with ingredients for us to self-assemble. 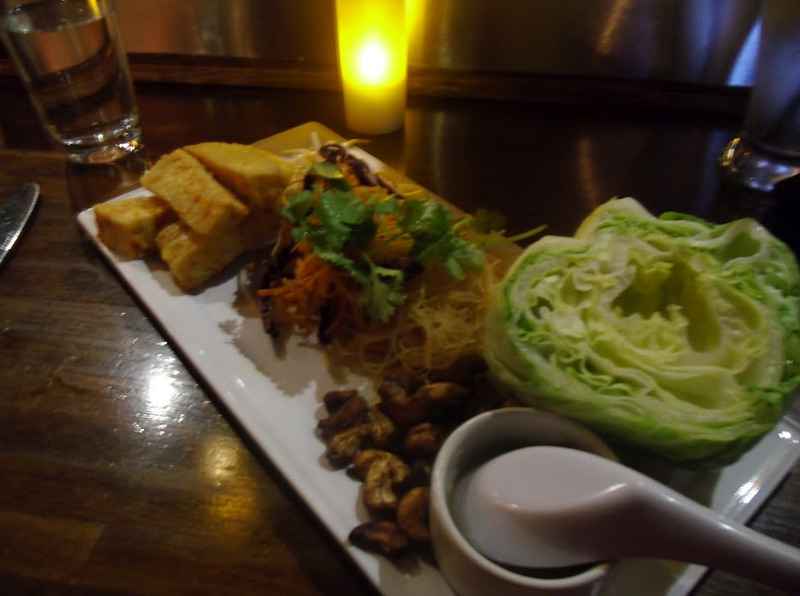 There were bean sprouts, shredded carrots and cabbage, thin salty rice noodles, toasted cashews, and honey-chili tofu. From the menu it sounded like the tofu was going to be deep-fried and M was a little disappointed to find it squishy, but it had a creaminess that reflected good cooking rather than its raw texture. The build-your-own format was a little messy but also fun, and we could top them off with a delicious sauce I'd put on anything. Our final course had prawn and scallop skewers, adventurous for me since I don't typically enjoy prawns; these prawns, however, changed my mind. 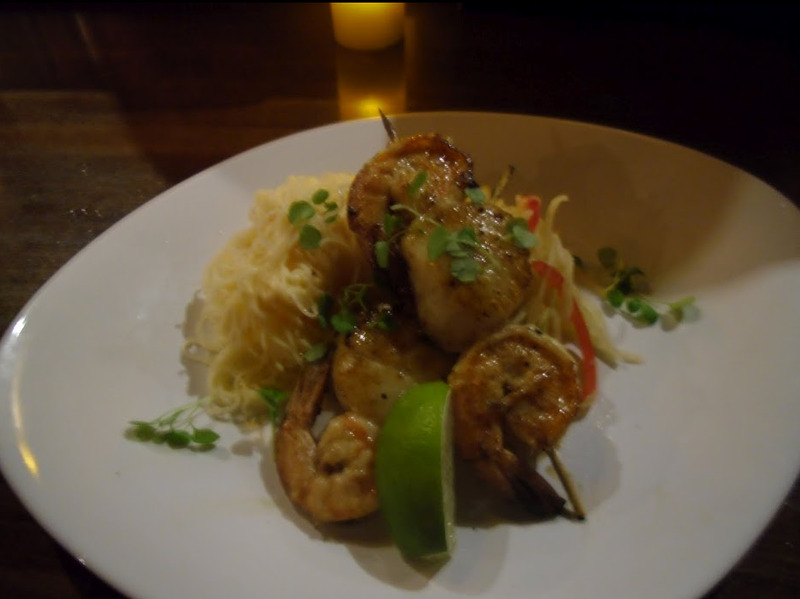 The perfectly caramelized outside made the scallops and prawns delicious, and they were very fresh and without any undue fishy flavor. The coconut vermicelli noodles that accompanied were a little disappointing because they were cold, but the papaya slaw with brown sugar and bell peppers was unusual and delicious. It was a lovely dinner and we were so grateful that Yelp steered us to this restaurant; it was just what we were hoping for and we would definitely (and will hopefully) return.